What do the names of the months mean? Which two months were originally unnamed? 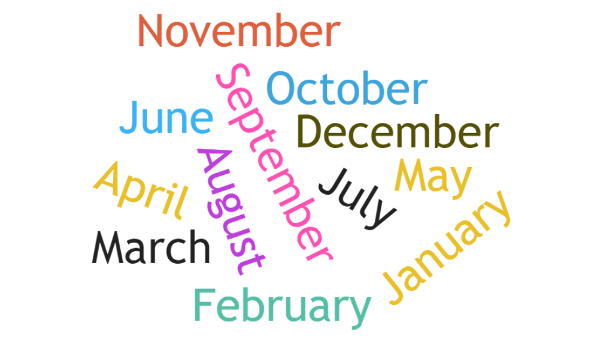 The English names of the months come from the month names in the Julian calendar. The Julian calendar was introduced by Julius Caesar in 46 BCE and took effect in 45 BCE. It reformed the old Roman calendar which consisted of 355 days divided into 12 months. Because the Roman calendar was 10 days short each year, a leap month of 22 or 23 days was introduced every two years, meaning every third year had 377 or 378 days. The Julian calendar kept the names of the old Roman calendar. The very earliest Roman calendar (8th century BCE) had 10 named months, beginning with March and ending with December, followed by two unnamed months of Winter. Around 713 BCE, Numa Pompilius (the second king of Rome) gave the names January and February to the unnamed Winter months. Ianuarius (January): named after Janus, the Roman god of thresholds and beginnings. Februarius (February): derived from februa which means purification. A purification ritual (Lupercalia) was celebrated on the 15th of the month to ward off evil spirits and purify the city. Martius (March): named after Mars, the Roman god of war and agriculture. This was the first month of the year in the earliest Roman calendar. It marked the beginning of both farming and warfare. Aprilis (April): the origin of the name is uncertain. The traditional view is that it derived from aperire (“to open”) in reference to this being the month when flowers began to open and trees to bud. Some scholars suggest that the month was named in honour of the Roman goddess Venus, but derived from her Greek name Aphrodite or the Etruscan equivalent Apru. Maius (May): the origin of the name is uncertain. The Roman poet Ovid says the name is derived from maiores, meaning “elders”. Other scholars suggest that the month is named after the Romans goddess of fertility, Bona Dea, but derived from the Greek version of her name which is Maia. Iunius (June): the origin of the name is uncertain. The Roman poet Ovid offers two different derivations for the name: iuniores, meaning “youth”, the other Iuno (Juno), the supreme Roman goddess of Olympus and wife of Jupiter. Iulius (July): Originally it was called Quintilis because it was the fifth month in the early Roman calendar following March. Romans tended only to name the first four things and then number anything that followed1. It was renamed in 44 BCE in honour of Julius Caesar. Augustus (August): originally it was called Sextilis because it was the sixth month in the early Roman calendar following March. It was renamed in 8 BCE in honour of Augustus Caesar. September: this was the seventh month in the early Roman calendar following March. It is derived from the Latin septem (seven) and ber (an adjective suffix). October: this was the eighth month in the early Roman calendar following March. It is derived from the Latin octo (eight) and ber (an adjective suffix). November: this was the ninth month in the early Roman calendar following March. It is derived from the Latin novem (nine) and ber (an adjective suffix). December: this was the tenth month in the early Roman calendar following March. It is derived from the Latin decem (ten) and ber (an adjective suffix).